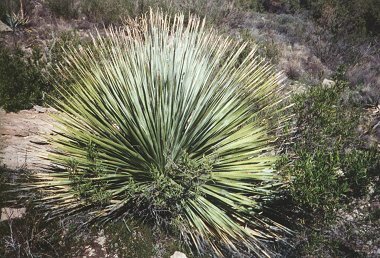 The Desert Spoon is a member of the nolina family (which also includes Bear Grass). The plant is easily recognizable by the hundreds of 3 foot long ribbon-like leaves which emanate from a central c ore forming a rounded ball. The leaves are light green and lined with small teeth along the sides. Sotol typically grow on rocky slopes in desert grassland between 3000 and 6500 feet in elevation. The Desert Spoon received its name from the fact that the base of the leaves, when pulled from the plant, are spoon shaped. In early summer the Desert Spoon produces a flower stalk which grows to 12 feet tall. The stalk produces thousands of greenish white flowers which grow in a long, dense cluster. Unlike agaves, which flower only once during their lifetime, Sotols produce a flower stalk every year. The plant is browsed by bighorn sheep. Native Americans used the stalks for building material and leaves for making baskets, mats and cordage.